Most collectors of German World War 2 handguns not only collect the guns themselves but also the accessories that were used with the actual weapons. It simply makes the "picture" complete. Often these accessories are more difficult to get ones hands on than the gun itself. This is definitely the case with the MP38 and MP40. Apart from the fact that most accessories are very difficult to get, a collector also has to worry if the accessory is fake or not. The market is flooded with fake pouches and to be honest most claimed "experts" hardly see the difference anymore between an original pouch or a reproduction. Another problem is that it is sometimes questionable if the accessory really has been used during World War 2 or even in the post war period. Think for example about the blank firing adapter or the sound surpressor. (Although I'm pretty sure about the last one). Just when I think my knowledge is complete about the accessories there suddenly turns up something new. Which is great! This accessory page is not only focused on wartime items. I also want to pay attention to post war accessories if it's used in the military. 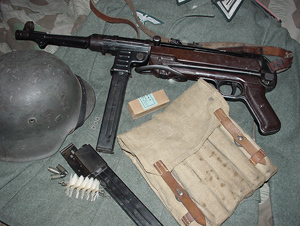 Countries like Norway and Israel made heavily use of the MP40 after the war. 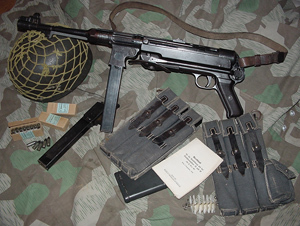 Especially Norway made some customized accessories for the MP38 and MP40.